Checking your PocketTV version: Start PocketTV and select About... in the menu. "Pro-" in the version indicates that you are running PocketTV Enterprise Edition. Check the Release Notes (below) to see if you have the most recent version. Changes and improvements are indicated for each version, starting with the most recent. All changes described in earlier versions (including versions not made available for a particular platform) are always included in later versions unless mentionned otherwise. To upgrade PocketTV (i.e. install newer version): You do not need to un-install or remove PocketTV in order to install a newer version. You will need to re-enter your activation key, so if you are using PocketTV Pro (Enterprise Edition), make sure you have your activation key or TransactionID (Order Number) available. For PocketTV Enterprise Edition, you can get your activation key from pockettv.com/key2. If you use PocketTV Classic, you can obtain a new key at pockettv.com/register. Before upgrading (Pocket PC and H/PC only), make sure the PocketTV is not currently running in background on your device. For that, we recommand doing a soft-reset (i.e. press the Reset button) before upgrading to terminate all background applications before installing the new version of PocketTV. This is generally not necessary on Windows Mobile 5 devices. Users who have purchased PocketTV Enterprise Edition are also entitled to unlimited free upgrades. Just download and install the latest Trial version of PocketTV Enterprise Edition to perform the upgrade, then re-activate the trial with your activation key. Go to the PocketTV Download Area to get the latest versions. If you have PocketTV on your phone, use the PocketTV > On Line > > Check for Update menu to update your PocketTV, or go to the PocketTV Download Area to get the latest versions. Worked around a spurious private messages firmware bug on Palm Treo 500v, Motorola Q9h, Asus P750, HP iPaq h5000. Fixed issue preventing captured image from being emailed on Windows Mobile 6 and 6.1. Now can send PocketTV log file automatically to PocketTV Support on Windows Mobile 5 and later. Log file can be sent automatically when logging is disabled (after being enabled). Fixed a bug causing random crashes when starting PocketTV with logging enabled. File Selector now uses Microsoft built-in by default on Windows Mobile 6.1 (tGetFile still available as an option). Added support for Handmark DRM fullfillment method. Fixed display issue on new Verizon Samsung i760. Added support for checking version updates. Worked around a spurious private messages bug on some new O2 XDA Zinc (that use a different identifier). Added support for full localization upon install. This also includes localization of the tGetFile dll. Added French, Spanish and German localizations (in addition to english). Worked around a spurious messages firmware bug on the O2 XDA Zinc and various E-Ten devices. Now using a more recent version (5.0) of the tGetFile dll that works better on Landscape Smartphones and fixes several bugs. Modified the CAB files to support the new Windows Mobile 6 (WM6) devices. Fixed issue with backlight dimming. Power control for keeping the backlight "on" while playing was not correct (issue probably introduced in version 1.3.7 with a change in the registry setup by the CAB file). Fixed issue with button assignment. Upon installation, the default button assignment was not set (issue probably introduced in version 1.3.7 with a change in the registry setup by the CAB file). Fixed issue with HP Rx5900 series. Due to a firmware bug in the HP Rx5900 series, the video was not displayed in the correct orientation. Fixed a problem in the CAB files and Setup files for Pocket PC 2003 & 2003 SE that was preventing correct installation (a dll was missing). Smartphone: Fixed an incorrect message when a correct activation key is entered. The message indicated an invalid key but yet the application was correctly activated. PocketTV is now capable of rebuilding its registry data to correct defaults if it starts on a device where it had not been correctly installed (e.g. when people swap memory cards from one device to another). Fixed some minor problems that were preventing un-install to remove all the Registry keys installed by PocketTV. Pocket PC: Added the option to remember the volume settings (which was previously only available on Smartphone). This option is useful when the device is used as a phone. PocketTV Classic installs some of the Online links (Download Games and Download Applications) in the Internet Explorer Favorites. There is now a new built available exclusively for Pocket PC 2003SE and 2003, that takes advantage of some features of those devices that are not available in earlier devices. We are therefore phasing out support for older Pocket PC 2000 and 2002 that are getting less and less used. Fixed a problem with logging that was causing the log file name to be erased at start-up. Pocket PC: Fixed a problem in the button mapping dialog that was occuring when the OK button was pressed to select a command. Smartphone: Fixed several problems with the Samsung SGH-i607 aka Cingular BlackJack. Added new Online menu that gives access to various OnLine services including Download Free Video, Purchase PocketTv Pro, Download Games and Download Applications. Some of those services are only available in PocketTV Classic, and may depend on the reseller where you purchased or downloaded PocketTV. Smartphone: The File Selector menu is improved by removing all the options that are not available on the device. On Smartphone: Fixed a bug that was causing the BACK key to go back more than one screen when pressed when PocketTV was not in Fullscreen mode. On Smartphone: Now all Smartphones with Landscape display are assumed to have a alphabetical keyboard, and the default button mapping on those devices is using alphabetical keys (rather than numerical). On Pocket PC: Improved button assignment dialog. The new dialog does not require using the stylus, and it will correctly display the buttons assigned on Pocket PC's that have an alphabetical keyboard. The new button assignment dialog is now similar to the one used on Smartphone. On Smartphone: Fixed the spurious vertical scrollbar issue in some dialogs on some devices (e.g. Motorola Q). Fixed a bug that was preventing free keys from working with PocketTV Classic. Free keys are not issued anymore for PocketTV Classic 1.2.10 since they won't work. Fixed a CAB error that was causing a warning to be displayed on non-WM5 devices. Fixed and improved button assignment on Smartphone, particularly when a keyboard is present like on the Motorola Q. The assigned buttons are now correctly displayed. Worked around a firmware bug on the Motorola Q that was causing PocketTV to crash e.g. when speakerphone was turned on/off. Improved / simplify the activation process of PocketTV Enterprise Edition. PocketTV now display properly on the new Motorola Q (Landscape Smartphone). PocketTV now does not display installation warning on Smartphones. PocketTV now supports the new Acer c500 Pocket PC. PocketTV now display properly on Smartphones that have SIF resolution. Earlier version would not scale UI elements correctly. PocketTV now display properly on Smartphones that are Landscape-oriented. PocketTV now detects what API should be used to prevent the Backlight from dimming while playing video. Corrected a problem on WM5 Pocket PC that could cause the SIP button to disapear when the SIP was opened/closed in an application running on top of PocketTV. This issue was traced to an obscure bug in the WM5 Pocket PC shell. Now PocketTV redirects the user directly to the Vendor's mobile website for purchase, allowing OTA purchase from Pocket PC's that are connected to the internet. PocketTV now uses the Power Management API (when available) to prevent the Backlight from dimming while playing video. Fixed the following problem on WM5 Pocket PC's: If PocketTV is in Fullscreen mode, starting another application using a hardware button (mapped of the application) would cause the NavBar (Start Menu) to become invisible, causing the device to be un-usable. PocketTV now correctly uses the Unique Device ID (if available) on Pocket PC 2003, 2003 SE and WM5. A recent change broke this feature except for Pocket PC 2002. This is now fixed. This means that the Registration and Purchase Code and key should always be the same on a particular device. Note that Registration and Purchase Codes (and keys) are always different from each other. Fixed the following problem: Exiting PocketTV while in Fullscreen mode would cause the NavBar (Start Menu) to become invisible, causing the device to be un-usable. Fixed problem triggered when doing a tap-and-hold of the Fullscreen icon until the tooltip was visible. Instead of going to Fullscreen mode, PocketTV would get into an incorrect configuration. This is fixed. The Icons are now correctly greyed-out when no stream is opened. The PocketTV "Help" menu and icons are removed if no Help file is available (based on PocketTV's registry values). The PocketTV Help file is not displayed anymore upon first run after installation. The user must select "Help" in the PocketTV menu to see the PocketTV Help file. First version with support for Windows Mobile 5.0 on Pocket PC (WM5 PPC). The WM5 version uses the new WM5 UI guidelines from Microsoft, i.e. it uses the soft-keys, but the icons are still available for direct access to common functions. All commands can also be mapped on hardware keys. Fixed problem triggered when changing the screen orientation while playing in Fullscreen. Improved support for square-screen devices: On square-screen devices, PocketTV now always displays fullscreen video in the current screen orientation. Pocket PC: changed the format of the setup files. The "default" Pocket PC setup file now contains 2 CAB files: One for WM5 and an other one that should install fine on all Pocket PC 2003 and 2003 SE (but not on 2000 and 2002 devices). Another setup file contains 3 CAB files for all Pocket PC's 2000, 2002, 2003, and 2003 SE, but not for WM5. www.pockettv.com/bin/PocketTVSetup-2000.exe for PocketTV Classic (freeware). Improved the toolbar on Pocket PC. In Portrait orientation, added the [i] icon mapped to the Media Properties dialog. Changed the Fullscreen icon to match the one used by Media Player. In Landscape mode, Added the following icons: [RGB] mapped to Adjust Colors and Contrast, [[]] mapped to the Change Size command (same as Action button), [camera] mapped to the Frame Capture command, [?] mapped to the Help command. Added the Help command in the menu on Pocket PC. Help opens the on-line help for PocketTV. The other way to get the Help is the standard MSFT Help procedure for Pocket PC, i.e. select Help in the Start menu or in Start > Programs, but this is so convoluted and un-intuitive that almost no-one knows about it. Updated the Help to reflect the recent changes (added Size > Fill Screen). Fixed problem on XDA II and other QVGA devices with ATI: There was problem causing the NavBar to disapear after using the Fullscreen mode on some devices when "Use ATI" was selected. The NavBar was not correctly refreshed in cases where PocketTV was borrowing the display surface for Fullscreen playback. This is now fixed. Fixed ATI-related bug: the display was incorrect or garbled after rotating the screen while PocketTV was de-activated. This was traced to a typo in the code. Fixed ATI-related bug: the display could displayed with incorrect orientation after rotating the screen while PocketTV was de-activated. Added new "Size > Fill Screen" option. This causes the image to be scaled so that the entire display rectangle is filled by the image (i.e. no margins). Generally, this means that some parts of the image will be cropped-off. This option is useful in particular for the new square-display devices. Added new "Fit Screen + 10%", "Fit Screen + 20%" and "Fit Screen + 30%" Size options. These options are sometimes useful to reduce the black margins coded in the video stream (that sometimes happen with letter-box or wide-screen aspect-ratio video). Note that the "Fit Width" and "Fit Height" options available in other applications are achieved identically by "Fill Screen" and "Fit Screen". The obsolete "Size > Auto" option has been removed. By default the "Action" or "OK" hardware button (in the middle of the D-pad) can be used to change the size between "Fit Screen", "Fill Screen" and "Nominal". To change the default mapping for this "Change Size" command, use "Option > Buttons". Reduced the occurences of "freezing" problems on the Dell Axim X50v and other devices using the Intel 2700G video accelerator chip. On devices that use the ATI chip, PocketTV now completely releases the ATI hardware as soon as it de-activates. This should resolve the issues caused by conflicts with the camera, i.e. camera capture not working when PocketTV was running in the background. This also allows other applications using the ATI hardware to run more efficiently without having to explicitely "Exit" PocketTV. Fixed the following problem: When PocketTV was in the background (i.e. de-activated) while the screen orientation was changed between Portrait and Landscape (or vice versa), activating PocketTV would cause the video to be displayed incorrectly. A significant part of the display-related code in PocketTV had to be re-architectured to provide support for those new features. The new code should be more robust and flexible, with no negative side effect in terms of performance and stability regardless of the video mode used, i.e. GDI, GAPI ("Fast Video"), ATI or 2700G. Fixed various problems related to audio synchronization. The problems were causing some streams to stutter or to have mediocre audio/video sync. The problem was traced to several bugs in the way audio PTS were handled. We believe that most of the audio PTS issues have been fixed. Changed the way PocketTV sets-up the file association for MPEG files upon installation. If MPEG files are not currently associated, installing PocketTV will setup the MPEG file association imediately (it used to be set-up only after running PocketTV at least once). It is still possible to restore the default PocketTV file association using "Options > Files > File Association" in case it was changed by another application. Eliminated tearing effects in some cases of hi-resolution streams when using ATI. Added brightness control when using ATI. Because the ATI hardware does not allow gamma or brightness adjustment of the YUV overlay plane, brightness control is done by shifting the DC value of the decoded luma intra blocks. This means that this control is effective only while playing. If you change the brightness when the player is paused, the change will not take place until you start playing again. Fixed GAPI configuration bug that was preventing PocketTV from running on the iPaq 3800 series. Improved handling of VBR streams: Now PocketTV displays the observed average total bitrate and displays a better evaluation of the stream total duration, based on this better estimation of the average bitrate. Previous versions of PocketTV were relying on the bitrate values found in the systems stream (pack headers) or in the video stream (sequence headers) to get the displayed bitrate. In general those values are incorrect in VBR (Variable BitRate) streams, therefore the bitrate and stream duration displayed by PocketTV were often incorrect. Now, PocketTV uses at the number of bytes and the number of frames found since the most recent seek, and uses those values to estimate and display the averate total (video + audio) bitrate. A new estimation of the average bitrate is performed every 5 seconds. This bitrate estimation is used to estimate the total stream duration (based on the file size) and the current time position. Fixed FlyPresenter Option (PocketTV Enterprise Edition). Fixed a bug causing a memory leak when using the ATI video hardware acceleration. Fixed a bug causing sub-optimum performances in some cases when using the ATI video hardware acceleration. Fixed a bug causing sub-optimum image quality when using the ATI video hardware acceleration. Fixed performance issue with the A02 ROM of the x50v. Fixed problem with Fast Forward with the 2700G. Display was incorrectly refreshed. Fixed a problem on the Dell Axim x50v: Worked around a race condition in the 2700G driver that could cause the display to appear black after tapping the pause button. Added support for VGA resolution with Dell Axim x50v and other devices with the Intel 2700G video hardware accelerator chip. When this option is available, it is selected by default (see "Options > Use 2700G"). Some VGA-resolution test MPEG files are available from www.pockettv.com/mpg/vga. We ran some benchmarks using the file 5e-640x480-1.7Mbps-v2.mpg in fullscreen (audio disabled), and we get the exact same results as Betaplayer (185%). Color controls (brightness, contrast, color saturation, hue) can be used with 2700G ("Options > Color > Adjust..."). Generally "Options > Color > Enhanced" will default to optimum values. You can see the adjustments in the image while you make them, and there is no performance penalty in using color adjustments. PocketTV automatically adjusts the orientation of fullscreen video to match the UI (User Interface) orientation on your device. You can set the UI orientation using "Start > Settings > System > Screen" or by mapping the <Rotate Screen> command on a hardware button using "Start > Settings > Buttons". When the UI is in Portrait orientation, you can select the fullscreen orientation using "Options > Fullscreen" from PocketTV. PocketTV automatically powers off the 2700G video hardware accelerator chip when the application is Minimized (i.e. de-activated in the background). So you have no risk of draining your battery faster just for having PocketTV sleeping in the background. Note that Betaplayer does not power off the 2700G when it is in the background. Note that if you also use Betaplayer, you should first Exit Betaplayer (using the Exit command in the menu) before starting PocketTV. That's because Betaplayer does not release the 2700G hardware when it is Minimized. So if you have Betaplayer running in the background (i.e. Minimized and invisible), you need to Stop it completely (Exit) before starting any other application using the 2700G (e.g. PocketTV). On the other hand, PocketTV does release the 2700G hardware when it is Minimized. So it does not prevent you to start Betaplayer. Hopefully the Betaplayer people will correct this problem so that they can co-exist better with other applications using the 2700G. Dell recommends that you install the latest firmware updrade for the x50v, which should reduce the "tearing" effect (caused by a bug in the 2700G driver). Be sure to make a full backup before installing any firmware upgrade. The Dell Axim x50v firmware upgrade is available from here. Improved performances in certain cases on devices with the ATI Imageon 3200 video hardware accelerator chip. In some cases, sub-optimum surface allocation was causing inferior performances. This issue has been fixed. Now JPEG Image capture ("Save Image...") works in all cases, including when Intel 2700G or ATI video accelerators are used. Previously, "Save Image..." was not working when video accelerators (e.g. ATI) were used. The Copyright Notice is now included in a separate copyright.html file and can be viewed by tapping on the icon in the About dialog. We had to do that in order to include the very long copyright notice provided by Intel. Fixed a bug that was preventing correct decoding of some very high bitrate streams with ATI acceleration in Landscape orientation. This bug could only be triggered with specially engineered streams, but nonetheless it has been fixed. Fixed a bug causing ATI decoder properties to not be displayed correctly. Added customized dialog required by Handango in the Trial version of PocketTV Enterprise Edition. Worked around a compiler bug in the eVC++ 3.0 C++ optimizer that was causing some incorrect block artefacts when using PocketTV Enterprise Edition in Fullscreen / Landscape mode on devices with the ATI Imageon 3200. Fixed a GAPI-related issue on some new Smartphone 2003 Second Edition devices (e.g. the Qtek 8010) that was causing the screen to stop being updated while playing in Fullscreen mode. Some performance improvement achieved by reducing access to cached data. Fixed a bug in the audio decoder that could cause PocketTV to hang/freeze randomly, requiring a soft-reset. Fixed some problems on devices with ATI Imageon 3200 series but without ATI External Memory (or with External Memory not enabled), such as the i-mate PDA2K, the O2 XDA II, and the Toshiba e800 in QVGA mode. The problems could cause video to not display or to display incorrectly when "Use ATI" was selected. On devices using the ATI Imageon 3200 series (e.g. Toshiba e800/e805 and iPaq hx4700), fixed bug causing occasional crashes when opening a new file. Fixed command-line option -auto_minimize. This option now causes PocketTV to correctly minimize when the end of the file is reached, when a file is opened using the command-line with this option. On devices using the ATI Imageon 3200 series (e.g. Toshiba e800/e805 and iPaq hx4700), fixed performance problem when the device screen orientation is set to Landscape using Start > Settings > Screen. On devices using the ATI Imageon 3200 series (e.g. Toshiba e800/e805 and iPaq hx4700), improved performances when playing hi-res (e.g. VGA or 520x392) streams in Portrait orientation. Fixed a race-condition bug causing PocketTV to hang occasionally, especially on devices with the ATI Imageon 3200 series. Fixed a bug causing the displayed fps to become incorrect after changing the video size while playing (e.g. by pressing the Action Button). The fps was correct only if the size was not changed while playing. Improved noticeably the fluidity (smoothness) of hi-res video in Landscape mode on devices using the ATI Imageon 3200 series, especially VGA-resolution Pocket PC's like the Toshiba e800/e805 and the iPaq hx4700. Some internal thread configurations and buffer sizes were adjusted to improve noticeably playback fluidity. Playback of hi-res video (e.g. 520x392) will be totally fluide in Fullscreen or Landscape mode. Improved noticeably the performances on devices using the ATI Imageon 3200 series, especially VGA-resolution Pocket PC's like the Toshiba e800/e805 and the iPaq hx4700. PocketTV can now play up to VGA-resolution streams, and the MPEG files do not need to be pre-rotated. Currently optimum playback if hi-res video is obtained only in Fullscreen or Landscape orientation. Playback of hi-res video (like 520x392 or 640x480 VGA) may not be as smooth in portrait mode, in this case just tap on the display to switch to Landscape mode for smooth, totally fluide playback. This limitation (that only affects hi-res video, not QVGA) will be corrected in future versions. Automatically corrects the incorrect Bitmap Cache configuration on the iPaq hx4700. Corrected the value of HKCR\pockettv_mpgfile\EditFlags. The new value causes the device to prompt for the downloading folder when an MPEG file is downloaded from a link using PIE. Previously PIE would always save in \My Documents, which may not have enough space. Fixed a tricky bug in the audio parser. This bug that was causing some streams to freeze PocketTV and/or lockup the device when reaching the end of some particular MPEG files. Added new Options > Files > Benchmark command. This command can be used to benchmark the performances of different devices against each other. Benchmarks are useful to determine the device with the fastest combination of CPU and memory speed. Naturally this new benchmark will give you just one more rating, and other benchmarks may give different relative ratings for the same devices. The Benchmark in PocketTV is somehow similar with the benchmark feature of Betaplayer, i.e. it will calculate the fps when decoding and displaying all frames as fast as possible. The audio is always disabled during benchmarking. You can benchmark using any part of a file (Betaplayer always start from the beginning). You can benchmark in Portrait or Landscape view (Betaplayer always run the benchmark in Landscape). The result displayed is the average speed (the only important benchmark value), which is the percent ratio of the actual fps over the nominal fps. All the other values displayed by the Betaplayer benchmark are derived from this one. You can use any MPEG stream to do a benchmark. Just make sure to use the same file and the same settings when you want to compare two devices. There are many test MPEG streams here: http://www.pockettv.com/mpg. Naturally, depending on the settings of PocketTV, the result of the benchmark will be very different. For example, if you de-select "Fast Video", PocketTV will use GDI, so the benchmark will be heavily impacted by the performances of the GDI routines BitBlt or StretchBlt on the device (StretchBlt is used when the video is scaled, BitBlt when it is played at nominal size). If "Fast Video" is selected, PocketTV uses direct access to the frame buffer (GAPI), so the performance will reflect the speed of writing in the video memory. etc, you get the picture :) . To do a benchmark, select Options > Files > Benchmark, then play the file. Don't interact with the device while playing. Benchmark result will be displayed at the end (or when you stop). A larger number means a faster device. Added warning message when using Fast Video on Mitac Mio 8390. Stretching slightly faster in some cases. Worked around GAPI bug on SPV C500. Fix a problem when de-selecting then selecting "Fast Video" on WM2003SE devices with screen set to landscape. Removed warning message that was displayed when selecting "Fast Video". Enabled free PocketTV Enterprise Edition upgrades for iPaq Rs3100/3400/3700 series that have PocketTV pro in the ROM. Fix a problem that was causing PocketTV to hang when it was started on the Dell Axim x30 while screen was set to landscape. This problem was affecting other QVGA devices. The problem was traced to a bug in the WM2003SE Operating System / Shell: ChangeDisplaySettingsEx with DMD_0 hangs when the device screen is not in portrait orientation. This also causes GXOpenDisplay to hang when when the device screen is not in portrait orientation. As a workaround, PocketTV uses the undocumented IOControl GETGXINFO (as suggested by Picard from Betaplayer). Smartphone: Improved detection of the processor type. PocketTV now tries to guess if the processor is Xscale by looking at the strings returned by PROCESSOR_INFO. Smartphone: Fixed a bug that was causing menu to be trashed if the menu was opened immediately after toggling from fullscreen display..
Smartphone: Re-organized the menu. Added Menu > Option > Settings > Fast Video. Added a new optimized stretching routine, improving noticeably performances on devices that do not have the ATI Imageon 3200-series chip. The new stretching routine improves the overall performances (i.e. fps) up to 500% in some cases, especially on VGA-resolution devices. Our new optimization is used when you play video with "Option > Size > Fit Screen" (i.e. strech to fit the display area), in either normal or Fullscreen mode, and when "Option > Fast Video" is selected (and "Option > Use ATI" is not selected). Until now, when you selected "Option > Size > Fit Screen", PocketTV was using the GDI stretching routine, even if "Option > Fast Video" was selected. But on some devices, the GDI stretching routine est extremely slow, due to poor optimization in the OEM's video driver. Changed default Size setting to "Fit Screen" upon first installation of the program. Fixed a bug introduced in 0.14.11, causing the image to be incorrectly displayed when "Fast Video" is selected. Improved performances slightly by optimizing some macros. Fixed a bug affecting some older devices, e.g. iPaq 3600 series, causing the image to be incorrectly displayed when "Fast Video" is selected. Fixed a bug that was preventing the selection of "Dither" after it was de-selected. Added support for scaling the video when using fullscreen on all devices (including those that do not have the ATI Imageon 3200). Until now, video scaling (e.g. Option > Size > Fit Screen) was only available when playing in normal mode (i.e. not Fullscreen), unless the "Use ATI" mode was selected (which only available in devices that have the ATI Imageon 3200 video accelerator). It now is possible to scale the video to fullscreen even on devices that do not have the ATI Imageon 3200. This is particularly useful with the new VGA-resolution devices. Currently, on devices that do not have the ATI Imageon 3200, video scaling is done using GDI routines (which may be slow, depending on the implementation of the GDI driver), but we will try to improve the performances by using more optimized routines in the future. When "Fast Video" is selected, scaling is now always possible (but it will revert to using GDI, unless "Use ATI" is selected). In previous versions, selecting "Fast Video" was disabling scaling. 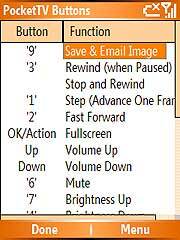 Pocket PC: There is now a default mapping of the Action button to toggle between "Fit Screen" (scaling of the video) and "Nominal Size" (no scaling). If needed you can set the default mapping with Options > Buttons. Tapping the display still toggles between normal and fullscreen view. When the ATI Imageon 3200 video accelerator is detected, its information (driver version, memory size etc) is always displayed in the Properties window, whether or not the ATI chip is used by PocketTV. Before, information was displayed only when it was used for accelerated decoding. Now PocketTV enables ATI hardware accelerated decoding if there is any AHI external memory available. Before, it was looking at the display resolution and enabling ATI accelerated decoding only on VGA devices. Fixed problem with some dialogs that were truncated when running in Landscape screen orientation on Pocket PC 2003 Second Edition. This problem was caused by a bug in the Microsoft MessageBox routine, which does not work well in Landscape orientation. PocketTV now uses the MsgBox Shareware library, a compatible replacement to MessageBox (see www.msgbox.info for information and download). Corrected the reported ATI memory size in the Properties dialog (when ATI accelerated deciding is used). Byte to MB conversions were incorrect due to a typo in the source code. Fixed a problem with the Dell Axim x30 and all other low-res Pocket PC's running Windows Mobile 2003 Second Edition (WM2003SE) and have a video driver that does not implement GETRAWFRAMEBUFFER. On WM2003SE Pocket PC's, PocketTV now attempts to get the address of the raw frame buffer using GAPI when GETRAWFRAMEBUFFER is not available. However PocketTV does not keep GAPI opened because on-the-fly rotating of the display while GAPI is opened causes WM2003SE devices to freeze, due to a bug in the OS. Improve format of the Tools > Options > Buttons dialog, for better localization support. Enable smooth scaling on Hitachi G1000, assuming this is fixed with their latest ROM upgrade (to be verified). Worked around a problem that was causing WM2003 devices to freeze (or misbehave) when closing PocketTV with Omega One Battery Pack. The problem was traced to Omega One Battery Pack incorrectly sending a message WM_COMMAND with IDOK, before WM_CLOSE, to close applications. The IDOK was causing PocketTV to call GetOpenFileName (standard OpenFile dialog), and for an unknown reason, probably a bug in the shell or the OS, this was in turn causing the device to freeze. PocketTV now ignors the message WM_COMMAND with IDOK in its main loop, which works around the issue. Fixed a problem in the Tools > Options > Buttons dialog, that was causing the columns in the list to be incorrectly sized. A bug was introduced in 0.13.15, causing PocketTV to retry opening a file even when the file does not exist. This has been fixed. Worked around a nasty OS bug on WM2003 and WM2003-SE that causes all storage card file handles to become permanently invalid after a suspend/resume (i.e. Power OFF/ON). See more on this problem in this PocketPCThoughts thread. Now PocketTV does its best effort to try to retry the command and even tries to re-open the files if any file-related routine (e.g. ReadFile) fails with an error like ERROR_DEVICE_REMOVED, ERROR_ACCESS_DENIED, ERROR_NOT_READY, or ERROR_DEVICE_NOT_AVAILABLE. Practically, this means that if you power OFF your Pocket PC while playing a video with PocketTV, you will not have to re-open the file after Powering ON the device. Power OFF / Power ON is now "transparent" to PocketTV. Worked around the OS bug on WM2003 and WM2003-SE that causes TerminateProcess to fail. This bug can prevent applications to be stopped when using Settings > System > Memory > Running Applications > Stop while the application is in a modal dialog, like the standard "Opne File" or "Save File" dialogs. Fixed a bug that was causing the ATI chip to sometimes crash/freeze with a pulsing display (on the e800 when using Accelerated deciding, i.e. in VGA resolution). This was happening when playing the blair.mpg file in a loop. The problem was traced to bug in the ATI firmware. PocketTV now has a workaround to prevent this from happening. Fixed a bug that was causing the Status Bar to disapear after PocketTV was de-activated (e.g. using the Smart Minimize "X" button), then re-activated. PocketTV now tries to reduce the chances that the display gets garbled when PocketTV gets de-activated (e.g. using the Smart Minimize "X" button) while it is playing video with "Fast Video" selected and "Use ATI" not selected. PocketTV now implements Microsoft's workaround to prevent the spurious vertical scrollbar in its fullscreen dialogs when in Landscape orientation. Ceased support for YUV overlay on ATI Imageon 100. Improved support for pre-rotated VGA-resolution files with ATI acceleration on devices with Imageon 3200, e.g. Toshiba e800 series. PocketTV now avoids re-using the display surface as much as possible, to reduce the problems with the VGA-Landscape modes of MyVGA and ResFix. In those MyVGA and ResFix modes, re-using the display surface does not work. Ceased support for YUV overlay on ATI Imageon 100. If you have a device with the ATI Imageon 100 and want to take advantage of this hardware, please use PocketTV version 0.12.2, available from www.pockettv.com/bin. Fixed a problem with the "Use ATI" option on the Toshiba e740 and e750 series. Removed the warning message when installing on a Windows Mobile 2003 Second Edition Pocket PC. Added support for Toshiba external VGA extension (for the e800 series). Corrected error message when trying to capture a frame while using ATI hardware-accelerated decoding. Allow mapping any PocketTV command on the Action button using the "Options > Buttons" dialog. Fixed a problem with Landscape left-handed when using direct access to the raw frame buffer. Fixed a problem that was preventing playing full-VGA resolution (640x480) on VGA-enabled devices (e.g. e800 with MyVGA) using the ATI acceleration. It is now possible to play full-VGA resolution files (pre-rotated or not). However, the fps is noticeably less than when playing 520x392 resolution. Optimum performances are obtained with pre-rotated 520x392 resolution played at nominal size. Added support for the new Windows Mobile 2003 Second Edition. PocketTV will check that the video driver implement the new GETRAWFRAMEBUFFER escape code, and display a warning if that's not the case. PocketTV supports on-the-fly display rotation on all Windows Mobile 2003 Second Edition Pocket PC's. Improved support for MyVGA and ResFix. PocketTV can now be used with the landscape modes of MyVGA and ResFix (2.0a), in both VGA and QVGA resolution. Added command "Fit Screen / Nominal Size". This command can be mapped on a hardware button, using "Options < Buttons". The command toggles between "Fit Screen" and "Nominal Size". Note that "Fit Screen" is not always available, depending on the method used to display the video. "Fit Screen" is generally available when GDI is used ("Fast Video" OFF) and when ATI is used ("Use ATI" ON), on the Toshiba e800. By default, this command is mapped on the Action button on devices that have the ATI hardware. Size options under "Options < Buttons" are now enabled when "Use ATI" is selected. It is now possible to control the scaling (e.g. "Nominal" or "Fit Screen") when using ATI acceleration. "Auto" is equivalent to "Fit Screen" if size is less than 520x392, and equivalent to "Nominal" if size is larger. Fixed handling of a rare low-memory error case on the Toshiba e800 series when decoding very hi-res video (larger than VGA) in VGA resolution. This error could arise in the following situation: The frame buffers for ATI hardware decoding are allocated, but later, the ATI surfaces necessary for display cannot be allocated. Currently we have no replacement routines that can do the display when the frame buffers are allocated for ATI hardware decoding, so this is an un-recoverable error. In that case, we close the file, disable the use of ATI acceleration (all-together) and display an error message. Ideally we should just disable the ATI hardware decoding, but right now the PocketTV UI does not have a command to enable/disable ATI hardware decoding and leave the ATI display acceleration ON. Note that this case can only occur when running in VGA resolution. In QVGA we test if the display will have enough memory to allocate the necessary surfaces, and if it does not, we just don't use hardware decoding. But the algorithm we use for this test does not work in VGA resolution, where the ATI memory is barely sufficient for doing decode and display. Added support for the ATI Imageon 3200 IDCT and Motion Compensation acceleration. This allows decoding of high bitrate or large resolution streams (up to VGA). Currently the only device supporting these optimizations is the Toshiba e800 series, and the memory needed by the ATI chip is enabled only when the device is used in VGA resolution. PocketTV will attempt to use ATI hardware decoding when "Use ATI" is selected, and if there is enough memory to allocate the necessary buffers. The 2 MB external memory used by the ATI chip is enabled only when you switch to VGA, so ATI hardware decoding generally requires that you use the VGA mode. You can disable ATI hardware decoding by setting the registry value [HKCU]\Software\MpegTV\PocketTV\EnableHardwareDecode = 0. In that case, "Use ATI" will only enable ATI overlay and scaling. When ATI hardware decoding is used, you cannot adjust the brightness and colors. Unfortunately ATI does not have any hardware-accelerated gamma-control (could have been implemented with a simple look-up table in there hardware - guess they didn't think about that). In VGA, rotation of VGA-resolution images to fullscreen is a bit slow, but it's much faster with PocketTV than with PMVP (we get 12 fps, they get only 5 fps). ATI decoding is disabled on the Hitachi G1000 because of some bugs in the ATI firmware on this device. But it should work on any other device that has the Imageon 3200 or future, compatible chip. Now, what to do with it? 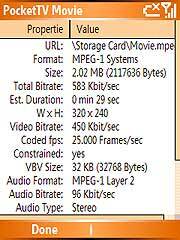 Well, if file size is not a problem, you can encode your MPEG's in QVGA (320x240) at high bitrate (2-3 Mbit/sec) to get excellent quality, with high-bitrate, high quality audio, and they should play quite well, probably 24 fps, on the e800. But remember, even if the MPEG file is QVGA resolution, you need to set the device at VGA resolution to enable ATI hardware decode. How to use PocketTV in VGA mode on the e800 ? You can use ResFix 1.x (the freeware) or ResFix 2.0a together with UnDead (you need UnDead if you use ResFix, otherwise the Start menu cannot be opened by tapping). You can also use Nyditot Virtual Display 3.5(coming soon). Currently MyVGA is not supported because it does not set properly the "Angle" Registry value when it rotates the UI (see this Microsoft documentation page). How can I check if the ATI hardware decoder is used ? Look at Tools > Properties. It will say "Acceleration: ATI". Fixed a number of compatibility problems with ResFix on the Toshiba e800 series. Fixed bug with video larger than 320x240 on the Toshiba e800 series. This bug, introduced in version 0.12.7, would cause video to not be displayed when playing in Fullscreen/Landscape mode with the "Use ATI" option. Fixed memory-alignment bug that was causing PocketTV to freeze when playing in "Inverted Portrait" orientation (in conjunction with ResFix and NVD). Improved support for on-the-fly display configuration changes with NVD. Fixed bug introduced in version 0.12.5 that was causing PocketTV to not rotate the image correctly on some Pocket PC's. Added support for ResFix 2.0 beta and NVD 3.5 (to be released) on the Toshiba e800 series. PocketTV is now aware of the orientation of the display when using those utilities, and it should display the video correctly. If you soft-reset your device or disable the utility, it is possible that ResFix and NVD leave incorrect values in the registry, causing PocketTV to believe that they are still active. This can cause PocketTV to display video with an incorrect orientation. Another way to prevent the problem is to first set the utility in normal orientation (Portrait) and normal physical resolution (320x240) before disabling it. Disabled smooth scaling on the Hitachi G-1000. Due to a bug in the ATI driver used on the Hitachi G-1000, we had to disable the smooth scaling on this device. Improved support for hardware scaling on devices that have the ATI Imageon 3200 video accelerator (e.g. Toshiba e800 series and Hitachi G-1000). PocketTV is now using arbitrary scaling (up and down) with smoothing (resampling filter) to scale the image to the size of the display (up to VGA). This scaling uses hardware acceleration provided by the ATI Imageon 3200 video chip. So the image quality on Toshiba e800 series and Hitachi G-1000 is much better than with the previous versions of PocketTV (which supported only integer scaling-up with pixel replication). If not enough memory can be allocated to do the smooth scaling, PocketTV automatically uses a less advanced algorithm that requires less memory (and uses only integer scaling). This Registry value instructs the Toshiba e800 series Pocket PC to make 2MB of external memory available for applications using the ATI chip when you set it in VGA resolution. By default, those 2MB are reserved by the OS for device bitmap caching. According to ATI, the so-called bitmap caching provides only very marginal gain and disabling it should not cause any noticeable problem. If you remove this Registry value, PocketTV (and other video players) will not be able to take advantage of ATI's video acceleration capabilities. Note: Unfortunately, when set in QVGA (standard) resolution, those 2MB of additional video memory are not available, regardless of this registry setting. This was decided by Toshiba to reduce the power used by the device (refreshing these 2MB of video memory uses power, even when this memory is not used). This limitation is currently hard-coded in the ROM of the Toshiba e800 series Pocket PC's. Added support for hardware scaling on devices that have the ATI Imageon 3200 video accelerator (e.g. Toshiba e800 series and Hitachi G-1000). If the video is less than half the size of the display (in each direction), then it is automatically scaled-up by an integer factor. The scaling is done by hardware, using the ATI accelerator (use ATI must be selected). For example, if a Toshiba e800 is configured with a VGA resolution of 480x640 (in Portrait orientation) using ResFix, a video at 320x240 will be scalled-up to VGA resolution when played in Fullscreen/Landscape mode. Fixed nag-screen issue introduced in PocketTV Classic 0.11.15. Registered PocketTV Classic would pop-up the purchase screen after one week. This has been fixed. Fixed registration issue introduced in PocketTV Classic 0.11.15. Registered PocketTV Classic would pop-up the purchase screen at Start-up. This has been fixed. There were lock-ups possible in the following scenario: a PocketTV modal dialog was displayed, then user goes to Today (or Home) page, then user selects PocketTV again from the Start Menu or Programs. PocketTV was not properly activated and the modal dialog could appear locked-up/frozen. This should be fixed in this release. Pocket PC: Fixed mapping of PocketTV functions on the 4 programmable buttons of the Pocket PC. This problem was introduced in version 0.10.2, due to a modification to support seeking on Smartphone. For example, the Play/Pause function would not work properly when mapped on button 1. The problem was only with the 4 buttons, not with the cursor keys or action button. PocketTV now prevents the Verizon/Samsung i600 Smartphone from blanking the display while playing video. PocketTV now Pauses when the Motorola MPx200 Smartphone is flipped closed, in order to prevent accidentally draining the battery. Improved BACK button handling on all Smartphones. The BACK button will now work as expected, including when playing in Fullscreen mode. PocketTV now takes advantage of the Kernel mode on all platforms where this mode is allowed (i.e. all Pocket PCs and the Motorola MPx200 Smartphone). On Smartphone, PocketTV now always sets-up correct pathnames in the HKCR keys for file association, even when installed in the bogus IPSM internal filesystem on Smartphone 2002 devices. On Verizon/Samsung i600 Smartphone, PocketTV Enterprise Edition now takes advantage of the Xscale processor. PocketTV now runs correctly on the SYMBOL PPT8800 and on all other Pocket PC's that decide to run applications in "User mode" rather than in "Kernel mode". If running on a Smartphone, PocketTV also attempts to run in Kernel mode (which works only if it is signed with a privileged certificate). The PocketTV on-line Help has been updated to include the new Save & Email Image command. PocketTV now pops a warning when it detects that it is running in "User mode" instead of "Kernel mode" on a Pocket PC, which is abnormal. The warning is displayed only the first time PocketTV runs on the device. Improved drastically the performances of the "Save Image" command (now the JPEG image is captured instantly). Fixed a bug that could cause PocketTV to freeze or crash on some ARM devices, due to a occasional memory aligment issue in the display routines. Fixed a problem with some streams displaying sometimes incorrectly (e.g. shifted in fullscreen mode). This problem was introduced in version 0.11.0. PocketTV now displays correctly streams encoded with a dimension larger than the size of the display (i.e. 320 for Pocket PC and 240 for Smartphone). You can now select the JPEG file quality: High (default), Medium and Low. On Pocket PC, this is under Options > JPEG. On Smartphone, this is under Menu > More > Files > JPEG. PocketTV now handles properly the case where the JPEG image cannot be saved (e.g. Storage full or SD card protected). PocketTV now displays correctly streams encoded with a size which is not multiple of 16x16. Previous versions of PocketTV could, in various circonstances, display padding around the video when the coded size was not multiple of 16x16. PocketTV now creates JPEG images of the correct size when captured from streams encoded with a size not multiple of 16x16. Previous versions of PocketTV was always creating image files with a size multiple of 16x16, with possible padding to the right and bottom of the image if the streams was encoded with a size not multiple of 16x16. PocketTV can now Email JPEG on old Pocket PC 2000. PocketTV can now capture and save images from the video in JPEG format (.jpg), using the "Save Image" command. On Pocket PC, this command is in the main menu. On Smartphone, this command is initially mapped by on "9" (to change the default mapping, go in "Functions"). If you are upgrading from a previous Smartphone version, you must select "Functions" to map the "Save Image" function on "9". JPEG images are small (a few KB's per image) and they can be viewed using PIE. On Pocket PC, you can open JPEG images using the File Explorer. All other Photo-album or Image viewer applications support JPEG files. Previous versions of PocketTV could only save images in an obscure format called Targa RGB (raw, uncompressed) that very few applications could read. The raw images were very large files, not suitable for mobile communications. PocketTV Enterprise Edition still has the option of saving images in raw Targa RGB format (.tga). The default quality of JPEG images created by PocketTV is high (80 on a quality scale 0 to 100). You can change this by changing the "JpegQuality" value under the PocketTV key in the Registry. By default PocketTV saves the JPEG images with the Gamma adjustments currently selected, so that the captured images will look as good as the video. You can change this by setting the "JpegGammaControl" value under the PocketTV key in the Registry. With "JpegGammaControl" set to 0, PocketTV will save JPEG images with no Gamma adjustments (faster). With "JpegGammaControl" set to 1, PocketTV will save JPEG images with the current Gamma adjustments (this is the default). After you have captured a JPEG image, PocketTV offers you to send it to a friend by email (as an attachment). JPEG images are small, so they will not need a lot of network bandwidth. On Pocket PC and H/PC: PocketTV now behaves the same way when opening files from the built-in File Explorer or from another file explorer or application. In previous versions, PocketTV would only play the file once (even if Repeat was selected) and then minimize itself when the file was opened from an application other than the standard File Explorer. The old behavior can still be obtained by passing the -auto_minimize command-line option before the filename parameter when starting pockettv.exe. On Smartphone: PocketTV now highlights the previously opened file in the file selection dialog. Added support for ATI hardware acceleration on the Hitachi G1000. PocketTV now uses the YUV overlay on the Hitachi G1000. The performance gain is 15-20% i.e. usually 2 to 4 fps. Best performances with the ATI acceleration are obtained by setting the Brightness to "Neutral" (Menu > Options > Colors > Adjust...). Added support for Smartphone 2003. PocketTV menus now display correctly on Smartphone 2003, with only one numerical shortcut. Solved installation problem on Mitac Mio 8380. We now work around a firmware bug in the Mitac Mio 8380 that prevents some applications from installing on the Mitac Mio 8380 (description of the Mio 8380 firmware bug). PocketTV now always closes the current MPEG file when it is de-activated. PocketTV can be de-activated when another application of the Home screen comes in the foreground or when you click on the "X" (Smart Minimize). De-activated applications are just invisible, but they are still loaded in the system. This change makes it much easier to delete or rename the MPEG files. It was ennoying to get an error message when trying to delete an MPEG file that was opened by an inactive (invisible) instance of PocketTV, as it requires either to do a soft reset of to kill/terminate/exit PocketTV. Most other Pocket PC applications do not close their data files when they are de-activated (e.g. WMP). Unfortunately MS forgot to mention this important point in their programming guidelines. Fixed problem with Microdrive option introduced in version 0.10.12: Playing from a Microdrive with the Microdrive option selected would cause the player to stall every couple of minutes. Removed support for older MIPS and SH3 based Pocket PC 2000 from standard packages. Pocket PC 2000 support is available from the www.pockettv.com download section. Fixed performance issue with iPaq 3800/3900 series, when playing from SD cards. Improved performances on many devices by having a new automatic detection of GAPI frame buffer memory performances. On some devices (e.g. Hitachi G1000), this can improve performances quite significantly (i.e. framerate gain of more than 20%) in either Portrait of Fullscreen (Landscape) mode. Fixed a bug with the Toshiba e740 and e750 series: video sometimes would not display when "Use ATI" was selected. Fixed a problem when running on the Arabic i-Mate Smartphone: Dialog fonts were displayed with an incorrect size, and the registration code was partly clipped, making registration impossible. Pocket PC: Worked around a firmware bug in the ViewSonic V3x series that was causing PocketTV to always ask for new registration keys with a different code. A bug was traced in IOCTL_HAL_GET_DEVICEID on the ViewSonic devices, causing an incorrect (and non-constant) Unique Device ID to be returned to the application. Pocket PC: Fixed problem when starting another application using the hotkeys (hardware buttons) while PocketTV was playing. In that case, PocketTV was not de-activated properly. Smartphone: Fixed problem when a call was received while playing a video in Fullscreen mode. PocketTV did not pause and the Phone screen what hidden by the video. Smartphone: Fixed problem with audio levels: In some cases the PocketTV audio levels were not restored when re-activating PocketTV. Smartphone: Fixed problem with the BACK button when in Fullscreen mode: Pressing the BACK button while in Fullscreen now returns to the previous application. Fixed problem with color scheme on Smartphone. Fixed problem of BACK sometimes not Canceling file selection on Smartphone. Added on-line help (Start Menu > Help). Fixed a/v sync problem with low bitrate streams, such as those demo files. After seeking or Fast Forward, a/v sync was lost in previous versions of PocketTV. Added "Move Forward" and "Move Backward" functions, so you can map seeking on hardware buttons (seeking with the Slider is of course more convenient!). Also added "Exit PocketTV" in the list of functions that can be mapped on hardware buttons. Added pre-amp (i.e. booster). The pre-amp kicks-in when you increase the volume while it is already set to max. This can cause distortions depending on the audio levels in the stream. Fixed problem with the FlyPresenter VGA card from LifeView. Added support for the IA-Presenter VGA Card from IA Style. Added support for ATI hardware acceleration on the new Toshiba e750 series. Fixed backlight issue on Loox: Backlight now stays on while playing video, regardless of the timeout setting. Added support for upcoming Acer n10 and n10w Pocket PC's. PocketTV Enterprise will be bundled with those devices. Auto-dimming occurs even when the user taps and holds (drags) the stylus for more than the specified timout. The system fails to detect that the user is interracting with the device. It appears that Auto-dimming only detects taps, not stylus being held and dragged. So if no tap occurs during the timout period, the system will think that you are not interacting with the device, even if you are actually interacting by holding and dragging the stylus. set the battery-power auto-dimming timout is set 10 sec (lowest setting on the Toshiba e550G). tap and hold while moving the stylus for more than 10 sec, and the light will go off. For example this happens when scrolling in a large document by continuously dragging the vertical scroll-bar with the stylus, or while slowly moving through a large video file with PocketTV by continuously dragging the slider. Fixed a problem with the "Save Settings" and "Load Settings" commands under the Colors options. "Save Settings" would save color settings files using the extension .poc instead of .pockettv_colors, while "Load Settings" is only showing files that have the .pockettv_colors extension. This problem was traced to a bug in Microsoft's GetSaveFileName routine on H/PC Platforms (only): When the file extension is not present, only the first 3 characters of the file extension are appended to the file name (instead of the full file extension). On Pocket PC, the entire file extension is appended. This problem was affecting the "Save Settings" command under the Colors options. On H/PC, PocketTV is now installed under the name "PocketTV Pro", for consistency with other platforms. If an older version was installed before upgrading to this version, you should un-install the old version, and you may have to enter a new key. 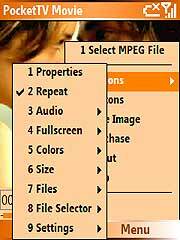 If an older version was installed before upgrading to this version, you should also select "File Associations..." in the Options menu, and re-associate MPEG files with "PocketTV Pro". If you don't do that, MPEG files will use the generic icon and you won't be able to open them from the File Explorer. Now PocketTV disables Auto-dimming while playing (thanks to Detlef Jenett for his help). This means that you don't have to tap the screen every minute or so to keep the backlight on, and you don't have to go in the Settings to change the Backlight auto-dimming settings each time you use PocketTV. Note: There are still a few devices where this does not work, like the HP 565 series and the Casio E-125. If you find another device where Auto-dimming is not disabled while playing, please let us know. "Load Settings": Load a previously saved color settings file. "Save Settings": Save the current color settings in a color settings file. "Auto Save" ON: When an MPEG stream is closed, PocketTV will automatically save the associated color settings in the "PocketTV Settings" folder. To load a color settings file, use "Load Settings..." or select "Auto Load" in the Colors options." "Auto Save" OFF (default): PocketTV will NOT automatically save the associated color settings when an MPEG stream is closed. To save the associated color settings file you must use "Save Settings..." in the Colors options. "Auto Load" ON: PocketTV will automatically load the associated color settings file when an MPEG stream is opened. If no associated color settings file is found, previously saved User Default settings are used (see "Save User Default"). To create color settings files, use "Save Settings..." or select "Auto Save" in the Colors options. "Auto Load" OFF (default): PocketTV will NOT automatically load the associated color settings file when an MPEG stream is opened. You can load a color settings file with "Load Settings...". "Auto Confirm" ON: PocketTV will ask you to confirm auto-loading or auto-saving of color settings files. "Auto Confirm" OFF (default): PocketTV will NOT ask you to confirm auto-loading or auto-saving of color settings files. "Load User Defaults": Load the current user default color settings. "Save User Defaults": Save the current user default color settings. The user default color settings are automatically used when "Auto Load" is selected and when there is no color setting file associated with an MPEG stream. When "Auto Save" is OFF, the "Load User Defaults" and "Save User Defaults" commands are disabled, and the current color settings are always automatically saved as user defaults. In this case, the behavior of PocketTV is the same as in previous versions. Now works on all NEC / Packard Bell Pocket Gear 2030. Some of those devices have been shipped with a faulty ROM that prevented PocketTV and some other applications from working (see details here). We have implemented a workaround. Enterprise Edition only: Added support for the FlyPresenter VGA Card from LifeView. If you have a FlyPresenter Card, you can play fullscreen video on a VGA, PAL or NTSC monitor with PocketTV Enterprise Edition. Fixed a bug that was causing reduced video quality in some sequences, most noticeably with PocketTV Classic. Fixed incorrect handling of certain system messages that could cause the display to be trashed. Previous versions of PocketTV would trash the display in the following scenario: while playing Fullscreen, start another application by pressing one of the hardware buttons (e.g. calendar), then select Today in the Start Menu. Those of you who have installed the latest version of PocketTV (0.9.2, which uses ATI hardware acceleration) on a Toshiba e740 may have noticed that the Letter Recognizer and Transcriber do not work properly when PocketTV 0.9.2 is running, including when it is just sitting idle in the background. Start PocketTV 0.9.2, then open the Notes application and try to enter some text using the Letter Recognizer and Transcriber, and you will immediately see the problem. It seems that on the e740, the Letter Recognizer and Transcriber use some special feature of the ATI hardware (the overlay plane ? ), which causes conflicts when an application wants to take advantage of the ATI hardware. This is really stupid, since the Letter Recognizer and Transcriber DO NOT NEED to use any special feature of the ATI hardware, so there should be no reason for them to not work when an application uses the ATI hadrware. Anyway, since we cannot fix Microsoft's (or Toshiba's) mistakes, we had to work around them. PocketTV 0.9.3 solves this problem. Basically PocketTV 0.9.3 releases all ATI hardware resources when it becomes inactive. Added support for ATI hardware acceleration (namely the YUV overlay plane) on the Toshiba e740. ATI acceleration can be turned ON and OFF using "Use ATI" in the Options menu. Default is ON. You do NOT need any ROM upgrade! If you kill/terminate PocketTV brutally (some applications like Wisbar may do that), you will need to soft-reset your device. This is because of a bug in the ATI driver that does not handle properly this situation. Always use "Exit" in the PocketTV menu if you want to properly terminate PocketTV and leave the ATI hardware in a correct state. The external memory bus to write YUV data in the ATI chip memory is quite slow, 4 times slower than the internal bus. PocketTV was already using a very fast YUV to RGB conversion, so it was taking already few CPU cycles overall. We have implemented brightness (gamma) and color-saturation controls, which requires additional software processing in the YUV domain. You can disable this additional processing by selecting the "Neutral" in the "Color" menu, but then the colors will look quite dark and dull. Also, at this time dithering is not supported by PocketTV when using the YUV overlay plane. So there may be visible color banding. Added support for VGA Expansion Pack on the Toshiba e740. To display on the VGA output (if you have the e740 Expansion Pack), select "e740 Expansion Pack VGA" in the Fullscreen menu (under Options). Note that the VGA display drivers only supports resolutions of 640x480 and higher, so the video will appear small in a large black display. Unfortunately there is currently no solution to this problem, as scaling-up each frame by software would be too slow, and there is no access to any ATI hardware acceleration when using the VGA output. Mostly internal architecture changes. Slight performance gain. Fixed problem causing PocketTV Classic to remove the PocketTV shortcut from the Start Menu. Changed default Dither setting to "on" of 16-bit Pocket PCs. Fixed registration bug causing nag screen to pop-up in PocketTV "Classic". Releases this new PocketTV Classic version which includes the optimizations for the Fullscreen/Landscape mode on Toshiba e740. This release also includes the optimizations for improved performances when playing from CF or SD Card. Improved performances when playing from CF or SD Card. Gain is noticeable on iPaq 3900 series, and/or with playing high bit-rate streams. Reduce the chances that the Start Menu will be trashed by the video if user opens the Start Menu while playing. The Start Menu was often trashed in the case where Sound for system events was off and/or the registry hack was used to remove the ennoying and slow Pocket PC menu animation (i.e. \HKLM\SYSTEM\GWE\Menu\AniType set to 0). Enterprise Edition Only: Improved performances by 5-10% on Xscale devices. Improved performances in Landscape orientation on the e740. Now detects properly the O2 XDA and correctly uses 12-bit dither for this device. Enterprise Edition Only: PocketTV Enterprise Edition now detects if an older version of PocketTV was purchased. This way the user who purchased an older version of PocketTV does not have to re-enter the key in PocketTV Enterprise Edition. Enterprise Edition Only: Changed the installation process so that PocketTV Enterprise Edition (PocketTV Pro) could co-exist with PocketTV "Classic", for those who want to compare the performance of both versions without having to install/uninstall each application. PocketTV Enterprise Edition now installs itself under the name "PocketTV Pro". It is installed in a folder called "PocketTV Pro", and it saves its settings under a Registry key called "PocketTV Pro". Change installation so that PocketTV does not install an icon in the "Start Menu". PocketTV now installs an icon in the Programs folder, and you can move it to the "Start Menu" with the "Settings>Personals>Menus". Fixed registration problem with H/PC running WinCE 2.11. Enterprise Edition Only: Fixed 8-bit display routines. Now includes the latest version of tgetfile, which fixes the duplicate-file problem when it was used with NetRunner. Enterprise Edition Only: Fixed problem with dithering. 16-bit dithering was causing dark vertical bars. 12-bit dither was not very nice either. Enterprise Edition Only: Minor adjustments to increase performances by another 5%. Added special optimizations for Toshiba e740. Solved the performance issue with Landscape mode on the e740. Released Casio Pocket Manager version which is now free for personal use. Enterprise Edition Only: Added optimizations for StrongARM and Xscale. Performance gain is 20% to 30% compared to PocketTV "Classic". Improved support for Language Packs (for internationalization of the software). Fixed audio problem on Casio BE-300 upgraded with Windows CE .NET Operating System. Fixed bug that could cause PocketTV to freeze/hang in some circonstances. The problem could occur when the Tools>Options>Size was set to 'Auto' ot 'Fit Screen' and the last file opened was not present when starting PocketTV. Added error message when trying to open files that are not in MPEG-1 format. Fixed bug in audio decoding that could cause PocketTV to lock-up the device in some cases. Improved handling of streams with incorrect mux_rate in pack headers, like those produced by Movie2MPEG running on Mac OS X. PocketTV now tries to guess the mux_rate based on the Video and Audio bitrates. Now ignores some non-critical errors in audio stream (e.g. incorrect emphasis in frame header) that were causing audio to not play at all. PocketTV can now play the incorrect streams produced by Movie2MPEG running on Mac OS X. Removed FlyJacket option from devices other than iPaq (FlyJacket is only available for iPaq). Fixed race-condition problem that could cause PocketTV to lock-up in some cases. You can install a PocketTV Language Pack to change the language. The default language is English. The first Language Pack available is French (free). Added support for the LifeView FlyJacket and Margi Presenter-to-go VGA Cards. Use the Fullscreen options to select the VGA card you want to use for video output. Added support for 256-color modes on VGA cards. Added support for JS LandscapeX 3.0 (requires JS LandscapeX version 3.02 or higher). Caveat: If you use JS Landscape, avoid doing a soft reset (by pressing the reset button) when your device is set in Landscape orientation. When you do a soft reset, the device restarts always in normal (Portrait) orientation, but the current orientation registry settings of JS Landscape will be used by PocketTV, possibly causing some erroneous display orientation. If that happens, change the display orientation from JS Landscape (go to to Landscape, then back to Portrait) and avoid pressing the reset button when the device is not set in normal (Portrait) orientation. Added support for Colorgraphic Voyager VGA Card. If you have a Voyager VGA Card, PocketTV can play video on the Voyager card. You can watch video on an external display device (e.g. VR (Virtual Reality) glasses. Use the menu Tools>Options>Fullscreen>UseVoyagerVGACard. PocketTV uses the current video mode of the Voyager VGA. Use other Voyager tools (e.g. Voyager Shadow) to select the current Voyager video mode. Best results are obtained with the 64k-color mode that has the lowest resolution. 256-color modes are currently not supported. PocketTV now behaves much better when using Gigabar. There was a problem caused by opening a PocketTV dialog, then activating another application, then activating PocketTV. This now works fine. Gigabar v1.5.9 should fix the problem of Gigabar visible when PocketTV is playing Fullscreen (that's a bug in Gigabar). Improved hardware button mapping option. On the Casio Pocket Manager, it is now possible to map PocketTV commands on the Lauch button (the Rocket button that normally lauches the Menu), and on the 7 touch-pad buttons at the bottom of the screen. On the HP Jornada 720, it is now possible to map PocketTV commands on the 11 function keys (at the top of the keyboard), on the "+", "-" and "play" audio buttons on the front side of the case, and on the 4 touch-pad buttons at the right of the screen. Fixed option Tools>Options>Fullscreen>AlwaysWhenPlaying. This option was ineffective in 0.6.5 due to a configuration error in the build. When this option is selected, the "Play" mode is linked to the "Fullscreen" mode (in other words you cannot play in normal mode or be paused while in fullscreen mode. As a consequence, you can play/pause by touching the screen. You can map any hardware button to (almost) any PocketTV command. The buttons that are not mapped by PocketTV keep their normal shell mapping (e.g. start Contacts). You can of course un-map individual buttons, unmap all the buttons and reset to the default mapping. PocketTV shows you the current mapping. Cursor keys (up, down, left, right) are correctly rotated when using the Fullscreen/Landscape mode, or when using a Landscape driver (e.g. JSLandscape). When this option is selected, the "Play" mode is linked to the "Fullscreen" mode (in other words you cannot play in normal mode or be paused while in fullscreen mode. Fixed problem of NavBar sometimes disapearing (becoming white) after using Fullscreen mode. Improved behavior when user opens the Start Menu or taps on the Smart Minimize (X) button while PocketTV is playing. Now there is less chances that the display will be left in an incorrect state in those cases. This was only a cosmetic issue (when 'Fast Video' is selected). Fixed problem with the Registration dialog. When a message was displayed on top of the Registration dialog, the owner of the message window was incorrectly set. This could cause problem by allowing the Registration dialog to come on top of the modal message window. Better cohabitation with other video applications (e.g. PocketDivX). The first time it is run after the first installation, PocketTV now checks file associations in the registry. If it detects that some file types normally associated with PocketTV are currently associated with some other application, PocketTV offers to restore the default PocketTV file associations, so that MPEG files opened from the File Explorer will be played with PocketTV. Previous versions of PocketTV would always overwrite any previous file association. New 'File Associations...' option (in Tools>Options>Files). This option checks the current file associations. If it detects that some file types normally associated with PocketTV are associated with some other application, PocketTV offers to restore the default PocketTV file associations, so that MPEG files opened from the File Explorer will be played with PocketTV. Fixed a rare problem with the 'Microdrive' option. When this option was set, PocketTV was attempting to detect if the file being opened was located in the internal file store, and did not allocate the additionnal cache buffer in that case. The test used was not reliable, causing the 'Microdrive' option to not work on some devices. This test has now been removed (until a reliable test can be implemented). As a result, you should enable the 'Microdrive' option only before playing files located on a Microdrive or other hard drive, or from remotely mounted file systems (since it was reported that the extra buffering improves the performances in that case). For best performances when playing files from Memory (Storage Card or internal memory), you should disable the 'Microdrive' option. The test was calling GetFileInformationByHandle and testing dwVolumeSerialNumber. A zero value was thought to mean that the file was in the internal memory (file store), but this is not always the case. Now detects iPaq 31XX series and disabled the Fullscreen/Landscape mode on those devices. For some yet undetermined reason, Fullscreen/Landscape causes lock-up on iPaq 31XX series. PocketTV now detects the E-200 and check if the Casio E-200 software update must be installed. If the update must be installed, PocketTV recommands the installation of the update and disables the use of GAPI to prevent any memory corruption problem. If the update has been installed or is not necessary, PocketTV runs with optimum performances. Worked around the Casio E-200 memory corruption problem. For some yet undetermined reason, Casio E-200 devices freeze and get their memory corrupted when running some applications that use the GAPI library (aka gx.dll). When this happens, a hard-reset is needed and all the memory content is lost. Casio is working on the problem and they will hopefully provide a fix to it. In the mean time, PocketTV now detects the E-200 and disables the use of GAPI in cases that were causing problems with the E-200. This is a temporary solution, while waiting for Casio's definitive fix. New 'Save Frame' command for capturing video images. Images are saved in Targa RGB format and can be viewed and converted to other formats (e.g. JPEG) with PQView 2.0.14 or later version. Fixed problem on Jornada 520 series. PocketTV would ask for registration key even though a key was registered. This problem was traced to a bug in a Microsoft library routine. Better handling of videos that have "vertical" or "portrait" orientations (a rare case). On devices that have portrait-oriented screens like Pocket PC's, those videos are not rotated in Fullscreen/Landscape mode. Casio Pocket Manager: Fixed problem with 'Fast Video'. When 'Fast Video' was selected and the player was paused, opening a file would lock-up PocketTV. Casio Pocket Manager: Better 'Open File' dialog using the tGetFile dll licensed from http://tillanosoft.com. Fixed problem on Jornada 520 series. Fullscreen/Landscape mode would lock-up PocketTV. Casio Pocket Manager: Changed UI to use Casio's proprietary controls. Command-bar re-designed to include more buttons. Generate registration Code based on device's Unique ID when available. Fixed problem on iPaq 3600 series: When Fast Video is selected and PocketTV is paused, turning device OFF then immediately ON was causing the display to stay black. Fixed display problem on iPaq 3800 series: With Fast Video selected or when playing in Fullscreen/Landscape mode, image border contained remains of previous screen content and playback was not very smooth. Added splash screen animation. Original PocketTV animation designed by Mona Caron Illustration. Animation not included in Casio Pocket Manager due to memory limitations. Fixed problem with joint-stereo mode. PocketTV now plays properly streams with audio using the joint-stereo mode. This fixes a problem that was introduced in PocketTV version 0.5.10 and 0.5.11. The joint-stereo mode allows higher audio quality than the stereo mode (for a given bitrate). Fixed "double icon" problem. The PocketTV icon was appearing in both the Start menu and the Programs windows of Pocket PCs, preventing the user from removing PocketTV from the Start menu with the 'Menu' Settings utility. Improved audio quality when quality option is set to "High". The backgroung hissing or ringing noise is now greatly reduced. On Handheld PC: Fix the following problem: PocketTV, when launched from a link in a web page, was not returning to the web page after playing the video unless PocketTV was already opened in the background. Fixed a few UI glitches. The most ennoying was the bad behavior of the Open File dialog that was causing the previous file to resume playing for a fraction of a sec when opening a new file. Improved the behavior on the new Pocket PC 2002 (aka Merlin) platforms. Use the standard X button in Nav Bar to minimize PocketTV. Added 'Open File' Icon in command bar. Better handling of the WM_HIBERNATE message (better behaviour in low memory situations). Better detection of device graphic depth. PocketTV volume control behaviour now consistent with the new Nav Bar volume control. Added audio option to swap left/right stereo signals. This option is necessary now that Compaq is finally producing iPaq's with a correctly wired earphone jack. Lots of iPaq produced before 2002 have inverted left/right stereo signals due to an incorrect wiring of the earphone jack. On those faulty devices, the Swap left/right option should be selected to correct the problem. Fixed small clipping bug. In some occurences, the image was clipped too much on the right side. Improved Volume control: When muted, increasing the volume now restores audio playback. Swapped 'Step' and 'FFW' icons in the command bar and removed separator, to optimize usage of the limited command bar real estate. There are known problems in this version. If you have PocketTV 0.5.7, you should upgrade to 0.5.8 or get the most recent version. Fixed problem on some Casio devices. PocketTV would not work properly with a Landscape driver (e.g. JS Landscape, NVD) set in Landscape mode, normal resolution. This problem was traced to a bug in GAPI 1.2 that seems to be triggered by the Landscape drivers: GXSetViewport(0, 320, 0, 0) fails in that case, for no apparent reason. We have been able to work around the problem at least on the E-125 and the EM-500, but that may not work on other Casio devices such as the IT-700. Fixed bug on some Casio devices. PocketTV would sometimes freeze when opening a file. Fixed bug on some Casio devices. Navigation Bar was sometimes trashed when switching between normal mode and fullscreen mode. Fixed bug (PocketTV would sometimes freeze when using 'Fast Video' without 'Play at Open'). Fixed Fast Video and Fullscreen on the new Casio IT-700 Pocket PC. Fixed some problems with WIS Bar (Nav Bar text was not always correct). Now PocketTV works well with the WIS Bar. Now PocketTV automatically installs tGetFile.dll. tGetFile.dll is an alternative to the default "Open File" dialog that lets you open files located in any particular, not just those that are in "\My Documents" and its sub-folders. tGetFile.dll is licensed from http://tillanosoft.com. For example, tGetFile can be used to open MPEG files that have been downloaded with Pocket Internet Explorer (those files are stored under \Windows\Temporary Internet Files\). Improved performances on the old Cassiopeia (WinCE 2.11 MIPS Palm-size) thanks to Dominik Behr's GAPI for Casio Cassiopeia E-10x library. Fixed problem on H/PC and Palm-size PC: PocketTV now hides the Nav Bar when playing Fullscreen. Fullscreen now works in Landscape orientation on Palm-size devices. Fixed problem on H/PC and Palm-size devices: it is now possible to start another application by pressing a hardware button while PocketTV is playing in Fullscreen mode. Open File dialog now shows .m1u files (MPEG-1 URL). Fixed incorrect hardware key mapping when using Landscape mode in conjunction with a Landscape driver. Improved "Microdrive" option. Using PocketTV with the "Microdrive" option was often causing memory problems, such as messages indicating a low memory situation. This problem should be resolved. Simplified registration for users that have a wireless internet connection: tapping on the link on the "register" or "purchase" dialog automatically fills-up the form with the Code indicated. Fixed display bug introduced in version 0.4.15: Fullscreen display was incorrect when using a Landscape driver at a resolution higher than 320x240 or 240x320. Added option to select the landscape orientation (right or left) when playing Fullscreen. PocketTV is now aware of the display landscape orientation when a Landscape driver is used. Landscape drivers supported are JSLandscape and Nyditot Virtual Display (NVD). Minimum requirements: JSLandscape-2.0 and NVD-1.2b. Added 'Fast Video' option on iPaq. This option improves performances when playing in normal (Portrait) orientation. Internal changes: The Video Output Handler API has been re-engineered to add better support for rotating the display in various orientations. Fixed icon associated with ".m1u" files (an ".m1u" file is a TEXT file that contain an MPEG-1 URL). Improved Color control. Added separate controls to adjust the Red, Green and Blue corrections. Added Contrast control. Renamed the Gamma control to Brightness, and the Saturation control to Color. Added better Default color correction setting for all devices. The Neutral setting does not perform any correction. Added support for tGetFile.dll. tGetFile.dll is an alternative to the default "Open File" dialog that shows ALL files, not just those that are in "\My Documents". Make sure to place the file "tGetFile.dll" in the "\Windows" folder. tGetFile.dll is free and can be downloaded from http://tillanosoft.com. Improved the "Open File" dialog on H/PC 2000. Now all files (*.mpg, *.mpeg and *.mpe) are listed together. New option allows PocketTV to re-open the last opened file when it starts. Fixed problem on H/PC when playing or streaming an MPEG file from a link in Internet Explorer or from double-tapping the file in File Explorer. When playback is completed, PocketTV returns correctly to the previous window. In last version, PocketTV would close the file but not return to the previous window. Improved performances on ARM platforms (e.g. HP Jornada 720). PocketTV is now FREE for personal use on all WinCE 2.11 HPC-Pro platforms. Fixed a problem with Registration in version 0.4.11: Users that had already installed PocketTV were asked to enter a key each time they started PocketTV. This problem is fixed in this version. You should upgrade to the latest version if you are using version 0.4.11. When using "Open URL", PocketTV now assume "http://" for URLs of the form "hostname/filename. Added 'Repeat' icon in the command bar. Added 'Purchase...' option for those who use PocketTV not just for personal use. PocketTV for the Pocket PC is free only for strictly personal use. This version is released for Handheld PC. Pocket PC users: Please upgrade to version 0.4.12. Fixed incorrect mapping of hardware keys (UP, DOWN, LEFT, RIGHT) when playing Fullscreen with the JS Landscape driver in Landscape mode. Increased slightly the performances on MIPS processors by code tuning. Included EULA (End-User License Agreement) in the package. The EULA can be read from the About dialog. Fixed minor display problem when playing Fullscreen from the File Explorer. Added error message when incorrect characters are entered in the Key field. Fixed a number of minor redisplay and event handling problems. Now keeps playing when a menu is opened or the menu-bar is tapped when FastVideo is selected (on HP and Casio). When an MPEG file is played by taping a link on a web page, PocketTV automatically returns to the web page once playback is completed. When an MPEG file is played by taping a file name in File Explorer, PocketTV automatically returns to the File Explorer once playback is completed. When an MPEG file is played in Fullscreen mode, PocketTV now exits automatically the Fullscreen mode once playback is completed. The LEFT key now rewinds only if the player is paused. Fixed problems occuring when running PocketTV with the famous (and very good) Jimmy Software Landscape/Hi-res driver (JS Landscape) on the iPaq and Cassiopeia. Now PocketTV's Fullscreen mode works well in conjunction with JS Lanscape and JS Lanscape 2.0. The only minor problem still there is that PocketTV Fullscreen/landscape mode currently works with only one landscape orientation, while JS Lanscape 2.0 supports both orientations. So in some cases you'll have to rotate your device 180 degres to watch fullscreen video if you are using the other orientation with the JS Landscape driver. We'll try to fix that some day! Fullscreen (landscape) mode now available for Casio and HP devices. In previous versions Fullscreen was only available on the iPaq. To switch into Fullscreen mode, tap the square icon in the command bar or just tap on the image. Implemented the 'Fast Video' option on ALL Casio devices (E115, E125, E125G, EM500, EM500G, EM505F, EM505I, EM505S, E700, EG800, E800, GFORT and E707). In previous versions 'Fast Video' was only working on the E115, E125 and EM500. Worked around a bug: The StretchBlt routine does not perform the correct clipping on most Casio devices. This routine is used when the video is scaled (up or down) to fit the display size. Fixed the 'Fast Video' option on Casio E-125. Added 'Colors>Adjust' option. It is now possible to adjust the Gamma, Saturation and Hue. On the iPaq, the 'Default' setting should improve visual quality of most sequences. The 'Neutral' setting does not do any correction (i.e. same as previous versions of PocketTV). If you are watching sequences that have been artificially color-corrected or gamma-corrected to look better on the iPaq, then you should use the 'Neutral' setting. In most other cases, the 'Default' setting should look better. You can adjust each parameter if you want. On other devices, the 'Default' setting does not do any correction (i.e. same as previous versions of PocketTV). Improved 'Microdrive' option. Now PocketTV does not stall anymore when the Microdrive kicks-in. The buffer size with the Microdrive option have been optimized for playing streams coded at 500 Kbit/sec or less. Removed confusing and useless 'Volume Range' option. Added 'live' links on the About page (live links work only if you have a network connection). New 'Microdrive' option reduces SIGNIFICANTLY (by about a factor of 5) the power usage when playing from an IBM Microdrive. It also allocates larger cache memory buffer. You should use this option only when using a Microdrive on battery power. Lots of internal changes in the front-end, mostly in preparation of future versions that will indicate status when a network connection is established. Got rid of Pocket-IE confirmation dialog that was popping up each time an MPEG link or streaming link was clicked. Changed the behavior of PocketTV's OK button: If PocketTV was lauched by clicking on a link from Pocket-IE, OK returns to Pocket-IE. If PocketTV was launched by clicking on a file from the File Explorer, OK returns to the File Explorer. If an MPEG file was opened from withing PocketTV, OK returns to the 'OPEN File' dialog. Added new one-click video streaming capability. See the one-click streaming demo page for details and infos about configuring your web server to use this new feature. PocketTV swaps right and left to cancel the effect of the incorrectly-wired earphone jack on the iPaqs. So from now on you don't need to exchange your left and right earphones. Fixed the slide bar (at last!). Now it is much easier to seek using a finger. It used to be very hard to grab the slider's thumb. Now the thumb always moves directly where you tap the slide bar! 'Fast Video' option now works with Casio EM-500 devices. Added support for extension *.mpeg (in addition to *.mpg). If you have this version, you should upgrade (the 'Dither' mode is broken in this version). Better handling of low memory situations: PocketTV now asks politely other running tasks to free some memory if needed. Now possible to adjust volume with UP/DOWN keys when paused or stopped. Support for proxy servers for streaming. Remembers URLs previously opened for streaming. Combo box to select URL for streaming. Fixed the problem with CF Backup/Restore: After a CF Restore, PocketTV was asking for a new key. This not the case anymore. Added 7 days grace period for registration. Assigned UP and DOWN keys to Volume control, LEFT key to Stop and RIGHT key to Play/Pause. Keys are properly rotated when using the landscape mode on iPaq. Fixed installation problems with Germanized Pocket PCs.